Daisy is a big fan of everything Disney, and after meeting her at Disneyland Paris earlier this year, she is particularly fond of Sofia the First! With that in mind, it goes without saying that last month, when she was sent the Sofia the First Royal Academy Backpack, it was love at first sight! The backpack is a wearable, magical pop up Micro World.... How cool is that?! No wonder Daisy enjoys playing with it so much. 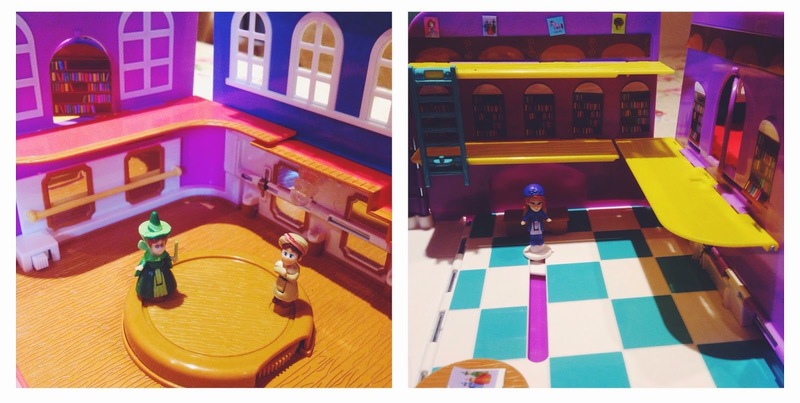 When it's opened, different play areas are revealed - a library, a classroom, a dance floor, an art room, a courtyard and a stable - and there are four micro dolls included to play with. Then it all folds away into a small satchel like backpack which can easily be taken out and about with you (or easily moved to a different room in the house if you have a little sister that's trying to join in with your game!). From a parents point of view, one thing I wasn't majorly keen on was the fact I had to sit down and stick a million stickers onto this set once we'd got it out of the box. Daisy was DESPERATE to get her hands on it and start playing but wanted the stickers all in place and kept moaning that I was being too slow! Three weeks after we got it, the stickers are also starting to peel off which I find rather annoying, although it hasn't bothered Daisy in the slightest. The backpack also requires a grown up to help put it away, and sometimes even I struggle to work out what folds away first!